... Natalia Ilyin reaches for the peroxide bottle to highlight our sometimes dark fascination with the light-haired... Blonde Like Me is a memoir masquerading as, or braided with, a clever critique of the obsession with blondeness... A wisecracking writer and smart scholar, often a pleasure to read, Ilyin could have taken her ideas further. Maybe she didn’t want to try the reader’s patience with too much academic analysis and organization...Still, it’s about time somebody peeled the foil off our obsession with blonde and blonder, and Blonde Like Me does. 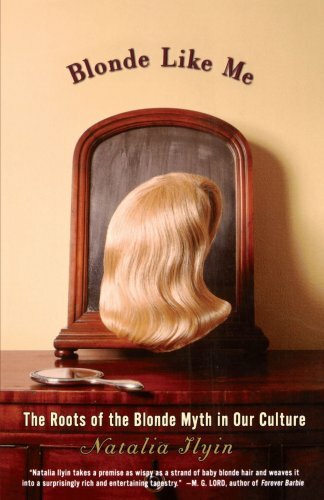 Ilyin, a teacher and a critic, has constructed an insightful and humorous examination of the meaning and myth of the blonde, especially blonde women, in American society. She introduces us to a few different kinds of blondes--the Apollo Blonde, the Trophy Blonde, the California Sun Blonde, the Moon Blonde, and the Ironic Blonde--each of whom corresponds to a series of cultural ideas and attitudes. Using real-life blondes like Marilyn Monroe, Martha Stewart, and Gloria Steinem to demonstrate these categories and weaving references to cultural theorists like Joseph Campbell and Robert Graves into the narrative, Ilyin has written a unique book. A nice companion to Forever Barbie: The Unauthorized Biography of a Real Doll (Morrow, 1994); recommended for libraries serving general readers and undergraduates. A flip, funny, thought-provoking evocation of the need to be a blonde amid all its mythic and symbolic ramifications. Because peripatetic cultural theorist Ilyin, whos taught at Yale and Cooper Union, was born a blonde and remained one until puberty, she and others like her, she avers, have the right to live a ``blonde life.'' That can mean anything from getting more attention from taxi drivers, subway conductors, and waiters to becoming the next Marilyn Monroe. Ilyins discourse begins with an inventory of the blondes on boxes in the hair-care aisle, ranging from the Golden Sunlight Blonde (most popular) to the lightest Baby Blonde. They break down into three categories: Sun Goddesses, Moon Goddesses, and Innocents. Among the blondes who preserve the face of innocencevulnerable, presexual, forever youngare the Virgin Mary, Princess Diana, and Nicole Simpson. Among the Sun Blondes are Martha Stewart (in the Summer Wheat subcategory) and Farrah Fawcett, epitome of the California blonde. But even sun blonde has its darker side, illuminated by delving into creation myths, Jung, and Hitlers Aryan ideal. A discussion of omnipotent Moon Blondes leads into tales of ancient goddesses, transformed today into the compelling yet dangerous decadence of Marlene Dietrich in The Blue Angel. Further subcategories include the Ironic Blonde (Gloria Steinem), the mixed blonde (Dolly Parton), and the old blonde, who opts for pastel colors in an attempt to hide the dreaded mythical crone beneath the look of a Walt Disney fairy godmother. It is not mere vanity at play with the peroxide bottle, says Ilyin, but a heroic attempt to blend myth with reality. Blondes, she notes, want to be remembered, just like the (blonde) Vikings. Must reading for all blondes, friends of blondes, and would-be blondesnone of whom will ever look at a dark root in the same way again. -- Copyright ©1999, Kirkus Associates, LP. All rights reserved.